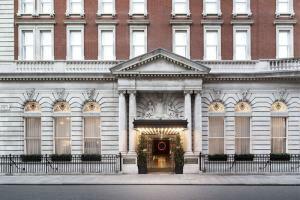 Boutique luxury and world-class service awaits you at The London Edition. Set within a historic building and just steps from Soho and the West End, this hotel is designed both to relax and inspire you. The elegant, unique accommodations and curated amenities enable you to experience the energy of London, while also providing a quiet oasis in which to recharge. Settle into your luxury room or suite, and connect with friends in the lobby and have a drink and mean at Berners Tavern, led by Michelin-starred Executive Chef Jason Atherton. Located 10 miles from London City Airport and 16 miles from Heathrow Airport.